ZTE didn’t come all the way from China to Barcelona to just announce smartphones. No, the Chinese are stepping up the slate market as well with their four latest Android tablets. 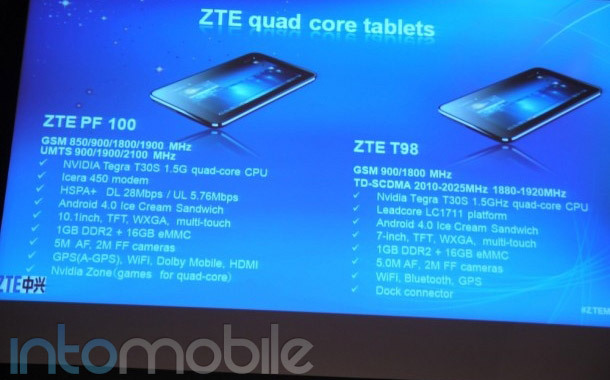 The line-up of new ZTE tablets consists of the PF 100, T98, V96 and V9S. The first two sport quad-core Tegra 3 processors and the other two make do with dual-core chips. Let’s start with the first duo. The PF 100 and T98 are both running on the Tegra 3 platform clocked at 1.5GHz with 1GB of RAM and Icera 450 modem supporting HSPA+. Storage for both is 16GB, with no microSD card support, sadly. At the back, both the PF 100 and T98 have 5MP cameras with autofocus and 720p HD video recording. Above the screen resides a 2MP fixed focus camera for video chatting. Time for the differences. The main one is the screen size, as you may have guessed. ZTE PF 100 is a 10.1-incher with WXGA resolution, while the T98 is pushing the same resolution on a 7″ diagonal. And to wrap those two up, their radios differ as well. The 10.1″ PF 100 rocks quad-band GSM, and tri-band UMTS networks, while the T98 supports only dual-band GSM and TD-SCDMA networks. Both the PF 100 and T98 run Ice Cream Sandwich. Both the ZTE V96 and V9S are 10.1-inchers and get their oomph from dual-core Snapdragon processors. The V96 runs on Qualcomm’s MSM8960 platform with dual-core CPU clocked at 1.7GHz and the V9S features the slower Qualcomm MSM8260 with its two cores clocked at 1.2GHz. Both have 1GB of RAM and 16GB of internal memory. MicroSD card slots are missing here as well. Like the other two, the V96 and V9S sport 5MP autofocus cameras at the back and 2MP fixed focus at the front. The V96 is the lucky one to run Android 4.0 ICS, while the V9S has to live with the older Honeycomb 3.2. Pricing and release dates are not available at this time.